The ESRI, in its recent Quarterly Economic Commentary (Spring 2014), suggests that the impact of the patent cliff in 2014 will be much smaller than in 2012 and 2013. In this post I present data that support such a position. I believe that the greatest impact of the patent cliff on Ireland will have occurred in the period from 2012 to 2014. I base this on a simple inspection of the expiration data related to blockbuster drugs produced by multinational companies which have Irish plants. Before presenting the facts, I provide the usual health warning – there are great uncertainties involved in estimating the effect of the patent cliff on the Irish economy. Most estimates are partly based on an analysis of the specific products losing patent protection and their global revenues. Relatively good data on patent expiry dates and global revenues is publically available. This data can then be linked to the companies operating in Ireland. Based on primary interview data and newspaper analysis, one can get a fair idea about which of the blockbuster drugs coming off patent are at least partially produced in Ireland. This allows us to get some idea as the size of the impact of the patent cliff on exports and GDP. There are, however, a number of uncertainties. Firstly, although we have good data on when blockbuster drugs are due to come off patent, not all of these drugs actually lose patent protection on the due date. Drug companies do what they can to protect their valuable intellectual property. Most will try to obtain an extension of their patent and some are successful. The granting of one or two patent extensions can seriously alter the impact of the patent cliff on a particular country. Secondly, even greater uncertainties are involved in estimating Ireland’s share in the global production of a particular drug. Pharmaceutical companies typically operate multiple sites for the production of active pharmaceutical ingredients and drug products. In some cases nearly 100% of the global supply is produced in Ireland, but in most cases we have no information about what share of production is accounted for by plants in Ireland. In most cases the only information we have is that part of the global production takes place in plants in Ireland. Table 1 presents the blockbuster patent expirations relevant to Irish plants during the period from 2011 to 2016 (data on the involvement of Irish plants is based on interviews and Internet search). The methodology provides no guarantee that all involvement of Irish plants is identified. However the pattern is clear enough to support my main argument. The data clearly show that patent expirations relevant to Ireland were concentrated in the period 2011-2012. Six blockbuster drugs whose patents expired, with a global sales value of $35bn, were at least partly produced in Ireland (Enbrel’s patent for the USA was extended). Because of the six-month ‘exclusivity period’, during which only one generics company is allowed to enter the market, the full effect on output will only be felt a half year after the expiration date. In addition, the table presents the expiration dates for the USA. In other markets, the drugs developed by US companies tend to come off patent somewhat later. 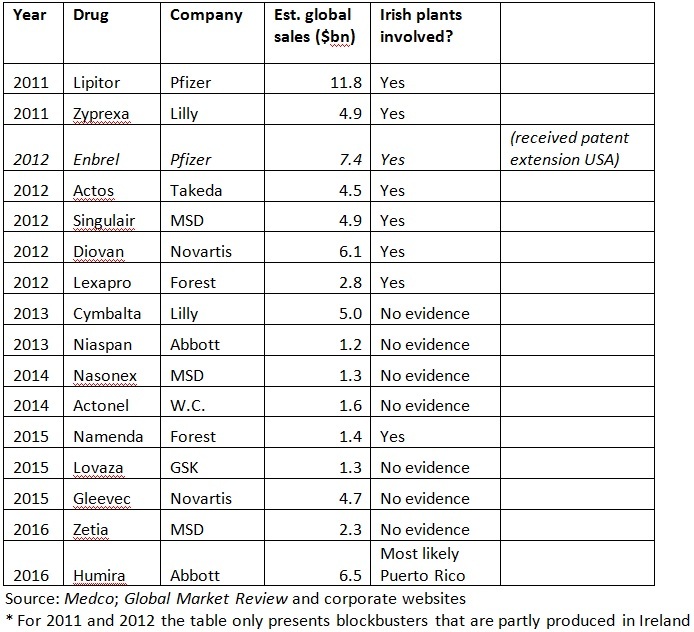 This phenomenon is clearly illustrated in Table 2 which shows that the full effect of the Lipitor patent expiration in the US at the end of 2011, is only reflected in the 2013 global export figures of Ireland. I therefore suggest that the effect of the 2011-2012 cohort (in Table 1) will be fully expressed in the 2012-2014 export and output data. The blockbusters that are losing patent protection in the 2013 to 2014 period have far smaller combined global sales ($25bn over the three year period) and, crucially, the data suggest that few of these drugs are manufactured in Ireland. I could only find evidence for one drug, Nameda, a relatively small blockbuster with $1.4bn global sales, coming off patent in 2015. These data suggest that in 2014 we will have passed the peak of the direct impact of the patent cliff on the Irish economy. This post is based on extracts from my discussion of a paper by Mary Dalton and Shane Enright (Dept. of Finance). “The Impact of the Patent Cliff on Pharma-Chem Output in Ireland”, presented at The Statistical and Social Inquiry Society of Ireland, Dublin: Royal Irish Academy, 6 March 2014. There’s no evidence that the ‘patent cliff’ has any impact whatsoever on employment levels in Ireland, taxes paid, or other. Has anyone in Ireland lost his/her job in any of these pharmaceutical companies? The prices of the drugs appearing in Ireland’s export figures are decided in some office in the US for tax maximising reasons. That will continue to be the case. It could even be the case that the prices of some drugs ‘falling off a patent cliff’ could actually INCREASE when exported from Ireland if that suited the tax-maximising multinationals. You really need to start reading Michael Hennigan (www.finfacts.ie) to get a better understanding of just how irrelevant the patent cliff is in Ireland and how nobody in Ringaskiddy, etc. is in the least worried. It’s all a bit like the Y2K scare. Plus ca change plus la meme chose. I agree that the impact of the patent cliff on employment will be more limited than the impact on GDP and exports. But that is not to say that it had no impact. The answer to your question “has anyone in Ireland lost their job in any of these pharmaceutical companies?” is: yes, hundreds. The Little Island plant closure is an example of job-losses that can be directly related to a specific drug coming off patent. And there are more examples. In addition, there are a number of clear examples of indirect job losses. Even if the Irish plants are not involved in the production of the specific drug coming off patent, jobs are lost where companies are cutting jobs as part of a global restructuring exercise in response to the patent cliff. I believe that the recent BMS plant closure is a good example. Much of the pharma exports are balanced by imports of services (royalty payments), so the impact of even large patent losses on the Irish economy is usually a lot less than the headline figures suggest. I am not sure what headline figures you refer to but you are correct in general terms. However, we must not forget that in a number of cases (part of) the intellectual property related to these blockbuster drugs was positioned in Irish subsidiaries (IP management companies or global supply chain management companies). Taking account of your point, Sean Enright and Mary Dalton of the Department of Finance still estimate that the patent cliff will have an effect of reducing GDP by between 2% and 4%. I accept there have been job losses as you point out but there is always restructuring among the MNC’s at any time and these don’t look huge for all the acres of print written about the patent cliff. Have you any figures for new jobs in pharmaceutical companies in the past few years? The MNC’s are here for tax maximising reasons. They could be exporting just plain white flour in capsules if it allowed them book revenues in Ireland. No new jobs but a pretty significant investment. My point is that the patent cliff is virtually irrelevant to Ireland in terms of overall numbers of people employed in the pharmaceutical industry and the industry’s contribution to the Irish economy (social insurance contributions, commercial rates, purchases of goods and services, etc.). I welcome their presence in Ireland and, for example, one of my brothers-in-law and his siblings were well educated and comfortably set up in life on the strength of their father’s well-paid job in Pfizer. The industry’s exports do distort our trade stats however and I suspect they have none or very low R&D linkages to the Irish economy. The companies are in Ireland principally for tax maximising reasons and even if drugs come off patent they will find other ways to divert drug production and profits to Ireland in order to reduce their overall tax bill. To spend research time or to have acres of newsprint predicting negative consequences from the patent cliff requires – in my view – a complete disregard or ignorance of the real reason Pfizer et al are in Ireland. It should be said also that the pharmaceutical industry in Ireland has considerable political power because of the employment it provides and its ‘cachet’ for luring other MNCs. The industry has lobbied fiercely against the use of generics and we still have some of the highest drug prices in Ireland – something on which even the Troika had to accept defeat.